If you like kitties, you’ll love this post! This evening after Allen got home, we caught both of our kitties being extra special cute:) They both have always had a “thing” for feet and enjoy sniffing shoes and socks but they took it to a new level tonight. 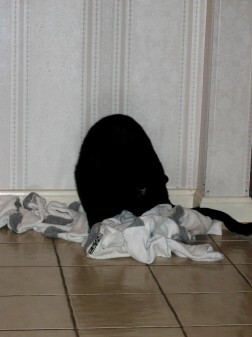 Allen had left a pile of socks for me to wash and after he added todays pair, Cooper and Zoe went wild. Here is Cooper when he first discovered the pile of goodness. And here he is rolling around. And Cooper hiding from the camera. 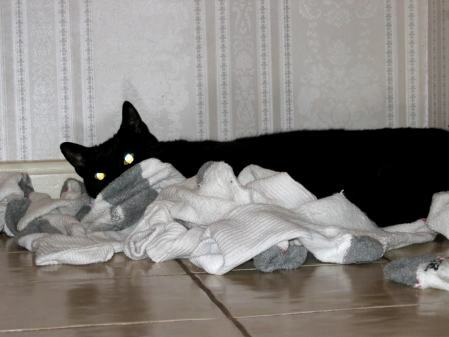 After he gave up on the socks, Zoe discovered it. And just another gratuitously adorable pic of Zoe. Aww so cute! 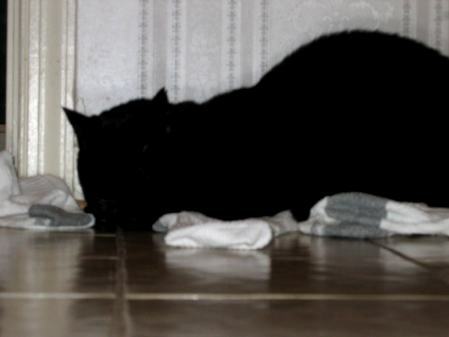 But ewww smelly socks lol. Zoe and Cooper look so sweet! Mine do the same thing except it is with any dirty piece of clothing. I love kitties and cats too. I had 3 Persian and 1 Black Stray. Your Cats look like my back stray if they just had some white on their chest and tummy. Mine weights between 10 and 12 pounds and sleeps with me every night. He sleeps so soundly that he actually snores! Zoe and Cooper are too cute! It’s amazing what cats can decide their latest muse is, isn’t it? Mine like celery brought home from the grocery store. How cute! They look like they both had a lot of fun. They’re adorable! If only my husband wasn’t allergic 🙂 Congrats on your goals from last month – you’ve done really well! 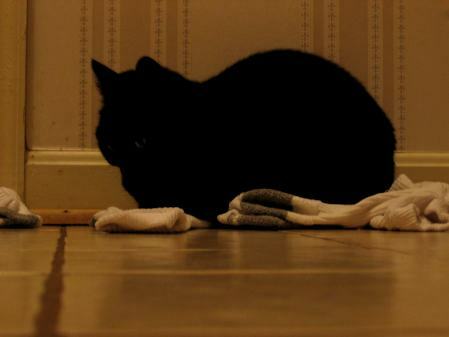 LOL, socks, huh? 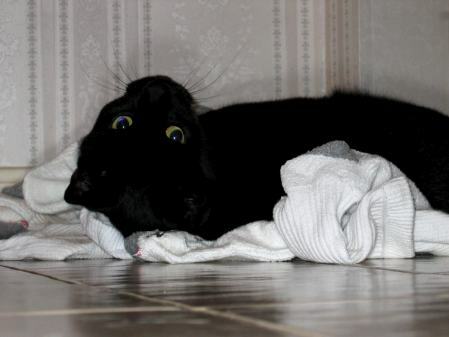 One of my cats looooves bath towels – he’ll steal them off the towel racks in the bathroom and curl up on them. Cute pictures of the cats! 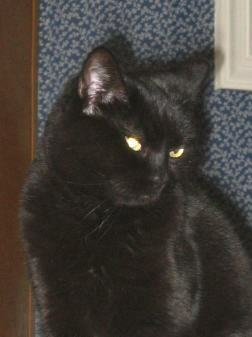 OMG since I got Hunter I adore black cats! I think their eyes are just so expressive but they’re so darned hard to photograph without the flash reflecting on the fur!